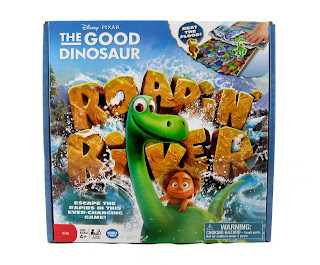 From Wonder Forge gaming (the same company that brought you yesterday's matching game), here we gave another Disney·Pixar The Good Dinosaur game that was released this past fall...Roain' River! 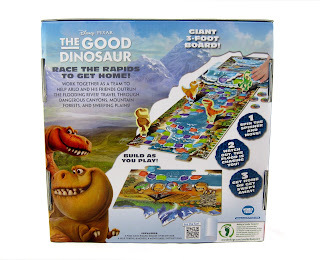 This was one of the very first Good Dino products that was ever seen (a photo of it was leaked from last year's New York Toy Fair in February), before it was even officially licensed. Ever since then, I knew it would be a fun addition to my collection! And it is. Though it's recommended for ages 4+, it's definitely a really fun game that kids and parents (really the whole family) can enjoy together. It's a fairly simple "spin the spinner" style board game, but with some twists. First of all, it's all about working as a team- you either all win or you all loose depending on how well you work together. There isn't just one winner. Another unique aspect of this game is that you build the board as you play, which is really cool (it makes for a different experience each time, depending on which order you use the different pieces). In the end, the game board is about three feet long. The game is for two to four players. The four characters included as "movers" are Nash, Ramsy, Butch and Arlo (with Spot). Here are the directions so you can get a fuller sense on how to play. Ultimately this is how it goes- the characters start at the bottom ("waterfall"). With each turn, the player will move to the nearest space indicated by the color on the spinner. Every time a character gets to the end of a game board piece, you add the next one from the pile set aside. When a player spins a "1" or a "2", you advance the "flood waters" piece up the designated amount of notches (which starts at the bottom of the board, right behind the characters). If the water "flood piece" reaches/touches any of the characters, everyone looses and you start over. The game is won once everyone reaches the top ("finish space on the mountain range") safely. Players can earn and use "help tokens" to help themselves or their teammates if the rapids get dangerously close. If you want to see this exciting game in action (it's easier to see rather than explain), check out this well done video HERE. This is another game I'll be putting away for my future kids. It'll be fun to bust out and play someday! 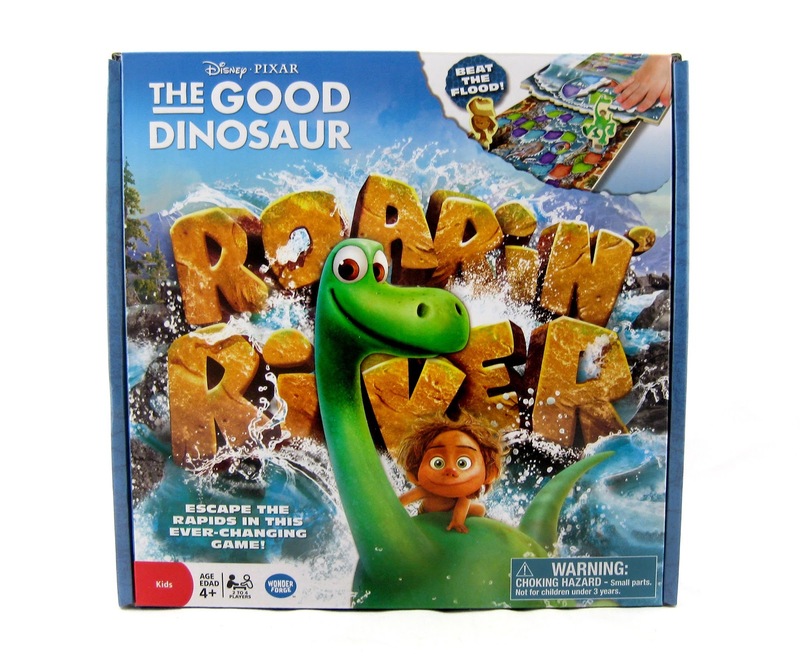 If you have a little The Good Dinosaur fan in your life (or a dinosaur fan in general for that matter), this may make a great gift. Be sure to check it out on Amazon using the direct link below (retail is $14.99).